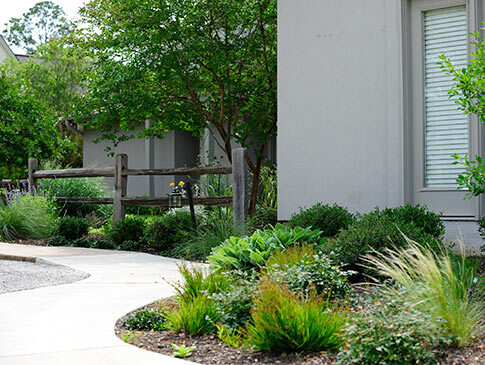 Brazos Landworks is a commercial and residential landscaping company offering landscaping, hardscaping, irrigation, and construction of water features in the Bryan/College Station, Texas, area and throughout the Brazos Valley. If you are a business owner, Brazos Landworks can give your property a well manicured and professional look. When your customers see that you care about your place of business, they will know that you care about them. Homeowners can be assured that you are taking a step to safeguard the investment you have in your property. for your flower bed and maintain it for healthy growth. Bryan-College Station, and the entire Brazos Valley area, boasts some of the most beautiful landscapes in Texas. Our almost sub-tropical climate allows us to successfully cultivate and grow plant species and varieties that are not available to landscapers in other areas of the state. At Brazos Landworks, we would like to encourage you to take advantage of the Brazos Valley's versatile landscaping opportunities and possibilities. There are many positive effects of hiring a professional landscaper. Add curb appeal to your home or place of business. Ensure that the plants selected for your landscape are native plants that will thrive in our climate. Receive expert advice about plant placing and spacing to ensure that your landscape will look better, not worse, with age. Create a more comfortable environment for people and pets since plants absorb heat and release oxygen. Call us today and schedule a free consultation to discuss a plan for your landscaping needs in the Bryan-College Station area or the Brazos Valley. Our prices are reasonable and our service is superior. That is our promise to you.